The Rolf Method of Structural Integration re-aligns and re-balances the body by lengthening and repositioning the connective tissue called fascia. As fascia is lengthened adhesions and holding patterns are released and muscles and joints can begin to move more freely and efficiently. Once aligned the body can return to its structurally optimal position, free from tension and pain and with a new found energy and fluid movement. Improper postural habits, injuries, stress and inappropriate movement patterns can pull the body out of alignment. When misaligned areas of the body gradually tighten they shorten and adjust to accommodate. What may start as a small imbalance can gradually worsen over time as the body begins to reinforce poor movement patterns and poor postural habits. This results in a build up of tension and strain that can lead to pain, stiffness, arthritis, tendonitis, loss of energy and increased occurrence of injury. New clients often begin with a series of ten 90-120 minute sessions designed as a comprehensive approach to integrating your whole body. The TEN SERIES is like a tune up for your entire body. It is a carefully designed systematic approach to align your structure; each session builds upon the last and prepares the body for the next. Movement education is integrated into each session in order to encourage long-term change and allow for new possibilities of movement. This Ten Series process restructures the body in segments aiming for optimal vertical alignment by balancing the body from front to back, side to side, top to bottom and inside to outside until complete integration is achieved. "Been wanting to do Structural Integration (Rolfing) for a long time, and finally started in December. Just finished my 8th session and feel great. I feel lucky to have found Corey Buck who is a pro, but also a generous spirit. For my Las Vegas friends, if you've ever wanted to try this, or just need a good massage, check out Las Vegas Myofascial Massage on FB." 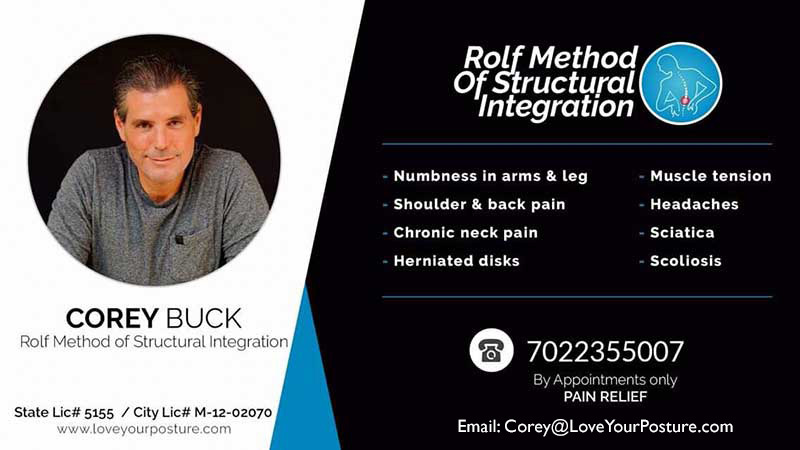 Structural Integration provides natural pain relief for a variety of issues including, back pain, frozen shoulder, carpel tunnel, ankle trouble, pseudo arthritis, shallow breathing, reverse breathing complications, headaches and many other symptoms. Rather than only focusing on the place that hurts or feels stiff; the therapist will focus on improving the organization of the ENTIRE structure and all of its movement patterns. You may have hurt your ankle and limped around for a week. This caused an imbalance in your knees and hips which lead to a compensation in your shoulders and subsequent pain and tension in you neck 20 years later. Until the underlying base of the problem is addressed and the entire structure is balanced and integrated, the pain and tension will remain as your body continues to struggle to hold itself upright. The Rolf method of structural integration gets to the root of the problem to create lasting results. In addition to Structural Integration, Corey also practices CranioSacral Therapy and Myofascial Release techniques. For more information please contact Corey Buck, Structual Integration Therapist at (702) 235-5007.